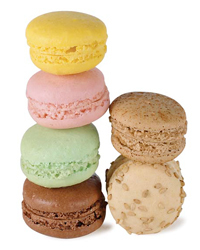 New Mad Mac macaroons from former Fauchon pastry chef Florian Bellanger are wonderfully airy (from $4; madmacnyc.com). Pierre Reboul, the pastry chef at Kurt Gutenbrunner’s New York City-based mini restaurant empire (Wallsé, Café Sabarsky, Blaue Gans), has created sweets like eccentric, delicious poppy-seed petits fours ($8; wallse.com). Tumbador Chocolate, by one-time Daniel pastry chef Jean François Bonnet, features chocolate bars filled with pâte de fruit ($3; temperchocolates.com).